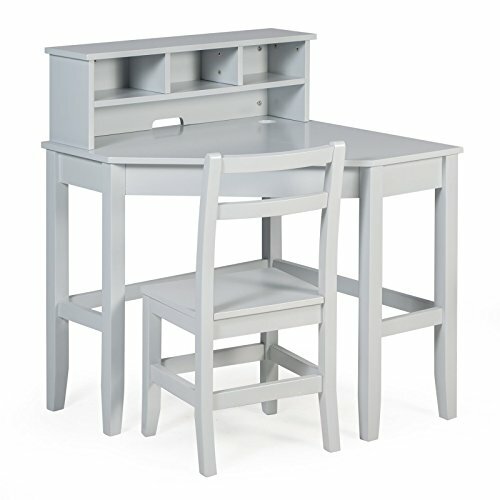 This junior desk set has a chic neutral gray finish that coordinates with a range of décor styles. The desk legs and chair are made of solid poplar wood, while the desktop and hutch are of quality engineered wood. This corner desk for kids fits nicely into a small space, making your child's room fun and functional. The reversible hutch can be placed on the left or the right side of the desk making it more versatile, meeting your room design needs. Three cubbies can hold school supplies or favorite toys, and cord management holes keep cords and cables neat and tidy. Desk with hutch: 26.5W x 26.5D x 28H in. If you have any questions about this product by Classic Playtime, contact us by completing and submitting the form below. If you are looking for a specif part number, please include it with your message.